Last time, we looked at the four staples of the Mesoamerican diet: maize, beans, squash, and chile. This time, we take a look at some of the meat sources, specifically from domesticated animals. When you think of Mexican cuisine, you probably think of dishes that include beef, chicken, and pork; one can hardly imagine a taco without beef. All three of these meats come from European livestock that was unknown in the Americas…well, except with one possible exception, but more on that later. Mesoamerica had its own domesticated livestock, some of it gracing the tables of every American household come Thanksgiving, while some others probably will make dog-lovers cry. So without further ado, here are the primary domesticated food animals of Pre-Columbian Mesoamerica. The turkey is one of two large domesticated birds found in the Americas, and it’s domestication dates back to about 200 BCE. As a food animal, it’s importance is unparallelled; it is said that in the market in Tenochtitlan, over 18,000 birds were sold every five days. 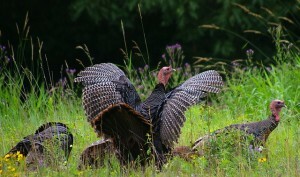 Turkeys were important in all sorts of rituals for the Maya, from medicine, to planting, to calling for rain. The turkey was an instant hit with Europeans, and soon took the place of peacock as a choice meat at feasts for the nobility back in Europe. The meat was roasted, baked, or boiled in soup, cooked into tamales or baked in casseroles. Turkeys were among the offerings sent to Cortes and his men by natives to test what kind of beings these strange pale-skinned men were; the stories go that slaves were sent as well, to see which ones the Spaniards would eat; if they ate the turkeys, they must be humans, but if they ate the slaves…then they must be fierce, bloodthirsty gods. 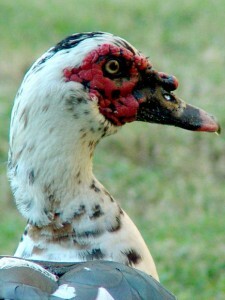 Known today as the “Barbary Duck” in recipes, the Muscovy is the second large domesticated bird of the Americas. Little is known of how they were kept and raised, and they seemed to have been consumed primarily in Central America. Interestingly, chickens were found in Peru prior to the Europeans’ arrival, and had been there long enough for them to become an important economic item to the Inca. It’s theorized that these New World chickens came from contact with the Polynesian Islands. As of yet there is no evidence of chickens in Central America though. Dogs weren’t kept as pets in Mesoamerica; instead, they were bred as a food source and raising such animals was a lucrative business. 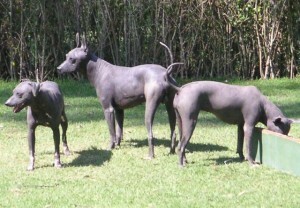 The dogs fattened for the dinner plate were a hairless variety related to the modern Xoloitzcuintle (not the Chihuahua), and after the Conquest, the breed nearly disappeared due to the Spanish pickling them in high quantities as food for their sailors. These dogs were thought to be particularly tasty because they were never fed meat, only a steady diet of maize mush or avacados. The Trigona, one of several species of stingless bees that produced honey in the Americas. Beekeeping was a very important trade among the Maya, though archeological evidence shows that even the ancient Toltecs practiced beekeeping, in logs they hung from the roofs of their houses. Indigenous species of stingless bees produced large quantities of honey not only for local use, but for export across Central America. The honey was used primarily as a sweetener of atolli, or was made by the Maya into the alcoholic ritual beverage Balché. Next time, we’ll take a look at the wild game that rounded out the meat sources of the Mesoamerican diet.